Shepherds in every part of the world have problems they must contend with as they care for their sheep. The Bible uses the analogy of the sheep and the wolves in several places. Jesus warned about the “hired hand” who would abandon the sheep. There are grey wolves in Turkey, thousands of them. There are also bears, jackals, and—recorded just last year for the first time in a quarter century—Anatolian leopards. All are the enemies of sheep and goats. As predators, they live at the expense of the prey animals, the meat-eaters against the grass-eaters. But on Turkey’s Anatolian plateau, the prey have a strong friend, more than a match for any predator: the kangal dog. On our last visit to the ancient Hittite city of Hattusas (modern Boghazkale) we saw a large number of sheep grazing over the ruins of the ancient city. 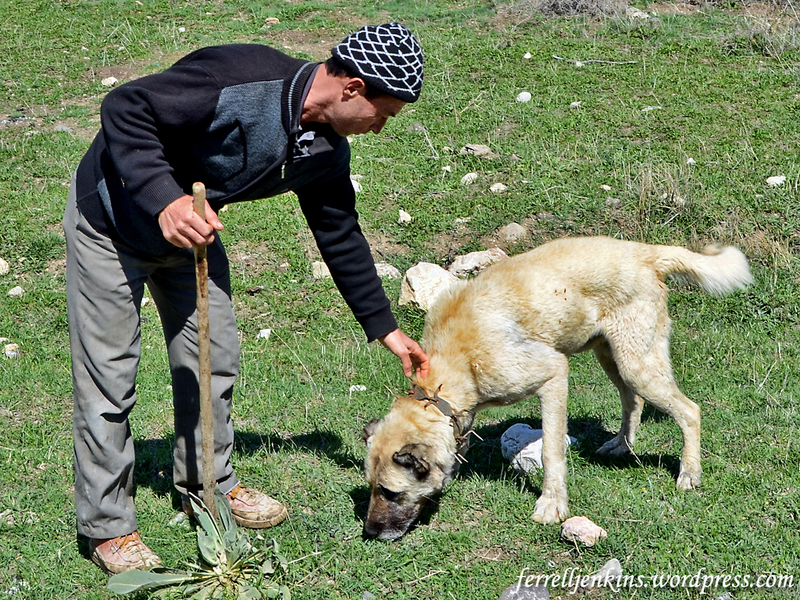 Our guide said that the dogs we saw with the shepherds were a special breed of dog that were common in Anatolia, but he could not recall the name of the dogs. In fact, he said might be a slightly different breed from the one he was thinking about. 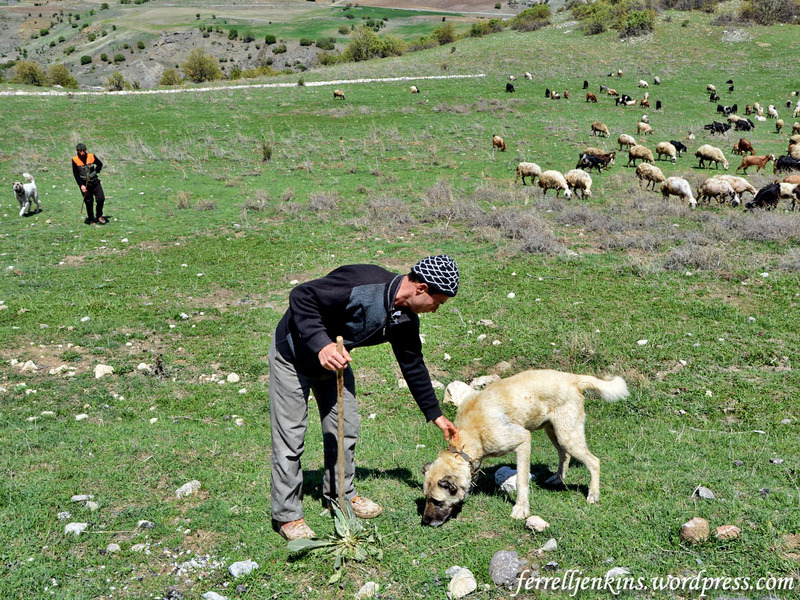 Shepherd at Hattusas with his sheepdog. Notice the collar that is specially prepared to protect these dogs from wolves and other wild animals. Photo by Ferrell Jenkins. Shepherds frequently dock their dogs’ ears, saving them the trouble of doctoring wounds when they tangle with a wolf. But the heavy spiked collar they wear, called a çengel, or hook, seems enough to keep even the most determined enemy from biting their heads. Here is a close-up, and you may click on it for an even larger image, showing the spikes or hook. A close up showing the spikes on the collar of the dog. Photo by Ferrell Jenkins. Shepherds of biblical times carried a rod and a staff (Psalm 23:4). The rod could be used to ward off an attacking animal. The staff was used by the shepherd as he made his way up and down the hillsides, and to separate the sheep. Source: Werner, Louis. “Shepherd’s Best Friend.” Saudi Aramco World July/Aug. 2003: 38-43. This is the first in a series of posts about Nicea, the site of the first and seventh ecumenical councils. The Ecumenical Councils met in the place we now call Turkey in the following cities: Nicaea, Constantinople, Ephesus, Chalcedon. My first trip to Turkey was in 1968 when I visited the area of the seven churches of the book of Revelation and the city of Istanbul. It was not until 1984 that I went back to the area with Melvin Curry and Phil Roberts, a couple of teaching colleagues, for a more detailed study. We also visited several of the Greek islands mentioned in the Bible. Then in 1985 I put together a tour I called, from that time forward, Steps of Paul and John. This tour included biblical sites in Greece and Turkey. At the end of that tour Raymond Harris, a fellow preacher, and I visited all of the sites associated with Paul’s first journey with the exception of Cyprus – a place I had already visited. In Heraklion, Crete, we stayed with a former student and her family during the 1984 trip. My recollection is that she made this photo as we left for the airport to go to Athens. Left to right: Melvin Curry, Ferrell Jenkins, Phil Roberts. In 1987 I conducted my first Ancient Crossroads tour to include the Hittite territory of Anatolia, Cappadocia, and the sites associated with Paul’s first journey. In 1995 the Steps of Paul and John tour included a cruise of the Greek islands. This cruise, touching at places like Patmos, Rhodes, and Crete, would be repeated several times over the years. I had been able to visit most New Testament sites in Turkey, but certain Old Testament sites had eluded me because they were far away in eastern Turkey near the borders of Syria, Iraq, Iran and the Soviet Union (now Armenia). In 1995 I was joined by Curtis Pope with whom I taught, and his brother Kyle, for a visit in eastern Turkey. We picked up a car in Adana, visited sites associated with Abraham and the Patriarchs, and went through the region of Urartu as far as the traditional Mount Ararat. 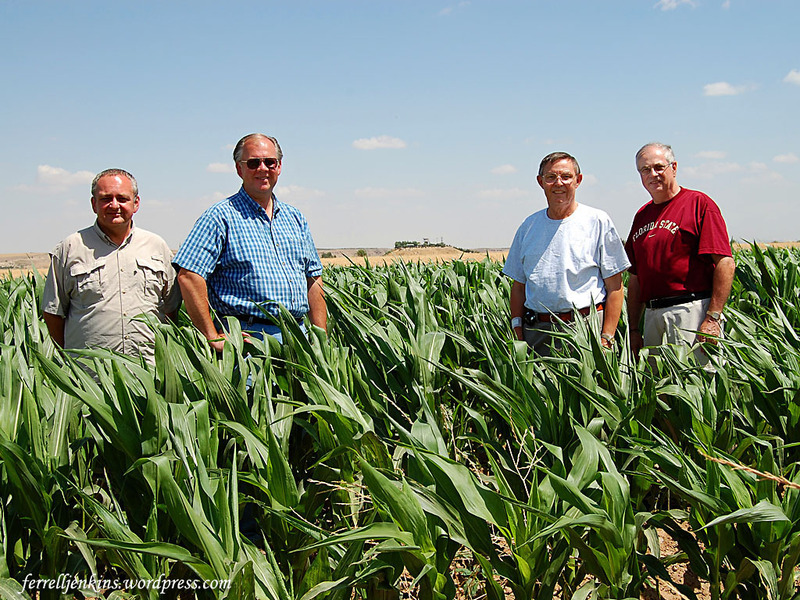 That is an excursion I would repeat in more detail in 2007 with Leon Mauldin, David Padfield, and Gene Taylor. Leon and I went back to the region of Paddan-Aram in 2014. In 2007, we had visited the Black Sea region of Turkey to explore the cities that might have been visited by the messenger who delivered the Epistles of Peter. See this Index of Articles dealing with this subject. This included the Roman provinces of Pontus and Bithynia. 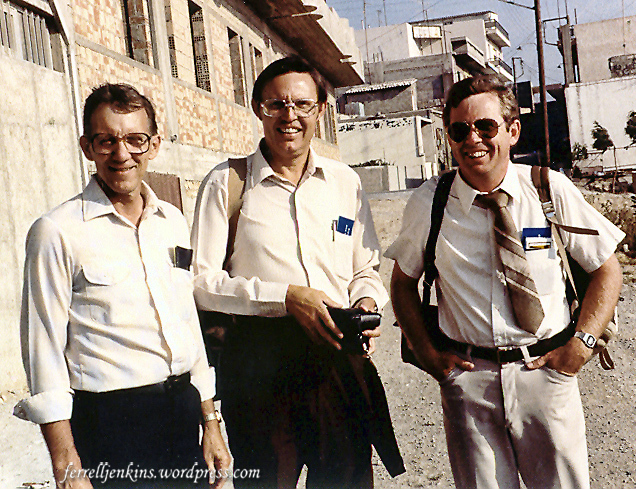 Eastern Turkey tour by Padfield, Mauldin, Jenkins, and Taylor (left to right). Carchemish is in the background center. We joked that we were out, standing in our field. Now it was time to visit the site of two of the Ecumenical Councils in Bithynia. Leon and I arranged to do this in 2014. From Istanbul it is possible to rent a car and travel to Iznik (Nicaea, Nicea) across one of the bridges connecting Europe with Asia. That would take a lot of time. We decided to hire a guide/driver to pick us up at our hotel in Istanbul in Europe, take a ferry across the Sea of Mamara to the Asian side into ancient Bithynia, and visit Iznik in one day. This excursion would cost us almost $900. 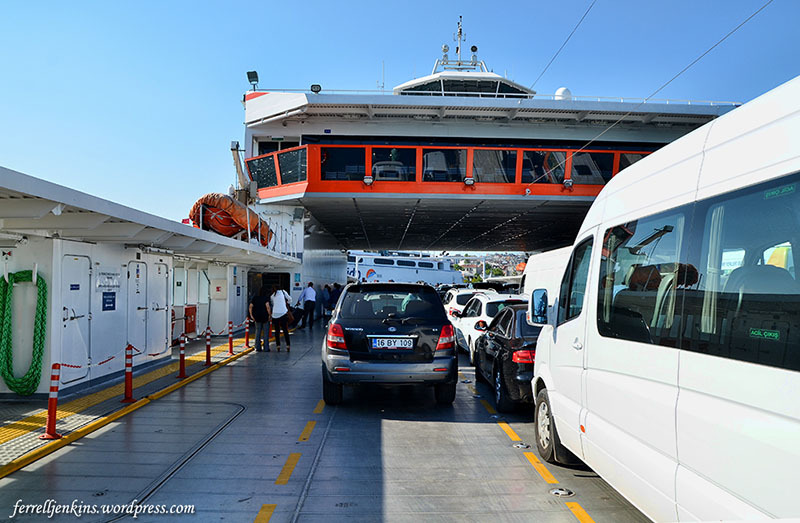 The return ferry from Nicea to Istanbul. Photo by Ferrell Jenkins. Here is where I hope to pick up in the next article and begin to tell you about the visit to Iznik. There will probably be about seven articles in the series, with lots of photos. I trust you will find them interesting and profitable. For the past week my wife and I have been traveling in Europe, revisiting some of the places we have enjoyed with groups over the years. Berlin is one of those places. We did some of the typical sightseeing, but the main visit was the museums with Ancient Near Eastern collections. My first visit to the Pergamum Museum was about 1978. I returned several times when the Museum was behind the Berlin Wall, and have been there several times since the fall of the wall. The Egyptian collection formerly was in the west, but now is housed in the Neues Museum in the building on the left of the photo below. Considerable construction is underway in the area. The former entry to the Pergamum Museum is closed. The red sign in the distance points to the temporary entry. Crowds are so large that people wait in line for four hours or more to buy at ticket and gain admission to the Museum. The only way to avoid this is to purchase a ticket online with a 30 minute time span for admission. I purchased a two day Museum pass after I arrived in Berlin and then made an appointment online for two different days. A single entry costs about 13 Euro (a little under $20 per entry). 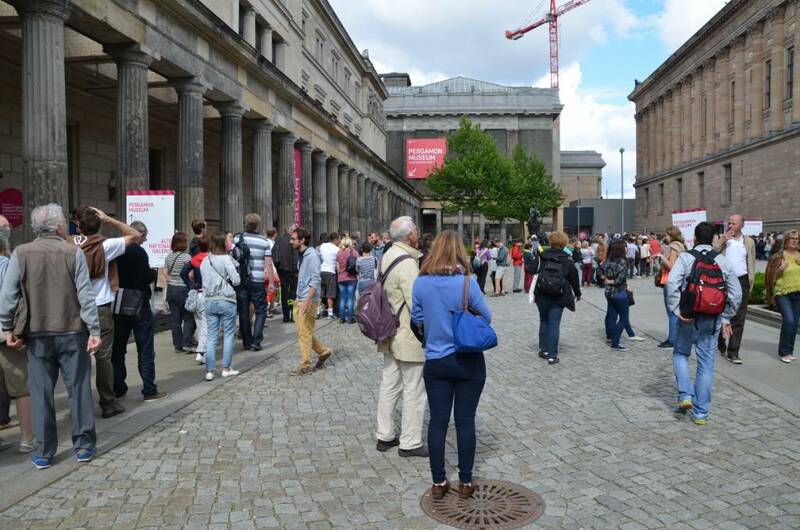 Crowds waiting in line to enter the Pergamum Museum. Photo by Ferrell Jenkins. The Pergamum Altar already has some scaffolding in place. At the end of September the exhibition will close for __________ years (you know about government projects). The visit was somewhat disappointing because of the appointment requirement, but mostly because portions of the Museum are closed. Whole galleries pertaining to the the Greco-Roman world are not open. The great Ishtar Gate from Babylon is open, and the Miletus Marketgate, which was covered with netting the last time I was in Berlin, is now one of the nicest exhibits. The halls dealing with Babylon, Assyria, and the Hittites were open. We are in Paris now and I have Wi-Fi at the hotel. The Louvre is closed on Tuesdays, so I went to the Tourism office and purchased tickets to the museum in order to avoid the long lines the next two days. The tickets here are under $20 per entry. If any reader has experience in loading photos from an Android tablet into WordPress I would be glad to hear about it. Who knows, maybe I will be able to load a second photo. My Ancient Crossroads Tour of Biblical and Historical Turkey is compete. Yesterday most of the tour members returned home. A few had other plans of travel before returning. There are some wonderful museums in Turkey, but many of them are undergoing restoration at this time. We missed seeing the main section of the Museum of Anatolian Civilizations in Ankara due to restoration. A nice, small section containing mostly classical materials was open, but the great collection of Hittite materials (our reason for going there) was closed. According to an article in the Harriyet Daily News it reopened last Friday. The Archaeological Museum in Antakya (Antioch of Syria, Acts 11, 13) was almost bare. Only a few of the lesser quality mosaics were on the walls. A new museum will open soon. I had told the group that we would see some good Hittite materials there, but they had already been moved. Incidentally, the Church of St. Peter and the Simon Stylites Monastery were also closed for renovation. We did better at the fabulous museum in Antalya (Attalia of Acts 14:25). The Roman period statuary from Perga in Pamphylia (Acts 13:13-14; 14:25) is housed there. In Istanbul we were able to visit the Ancient Orient section of the Archaeological Museum. The museum containing material from the classical world was closed. An excellent selection of materials was housed in a small area of the Museum. The third floor, where artifacts from Palestine are housed was closed. Our appeal for entry failed. There is where some very famous pieces are housed − the Siloam Tunnel inscription, the Gezer Calendar, the Herodian Temple inscription forbidding gentiles from entering the Temple, et al. The Ancient Orient building houses a large number of bulls, dragons, and oxen from the procession street of ancient Babylon. I think it is second only to the Pergamum Museum in Berlin. There are excellent Hittite materials, including the oldest treaty between nations. It is the treaty between the Hittites and Pharaoh Ramses of Egypt after the battle of Kadesh on the Orontes. There are several pieces from the Assyrians, and a clay cylinder from the time of Nebuchadnezzar. 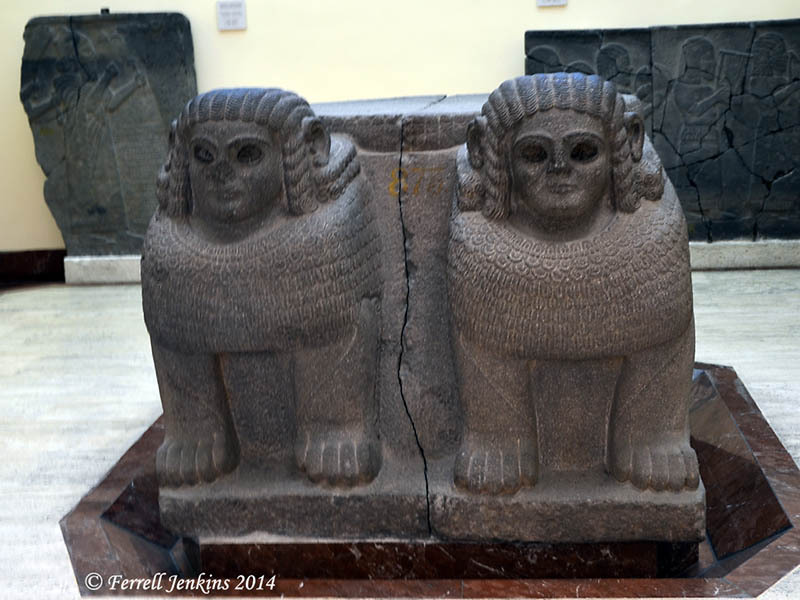 Here is a picture of one of the basalt Hittite column bases from Sinjerli. It is a double sphinx, dating to the 8th century B.C., that came from the entrance to Palace III. Front view of Hittite column base from Sinjerli. Photo by Ferrell Jenkins. Below is the side view of this column base. 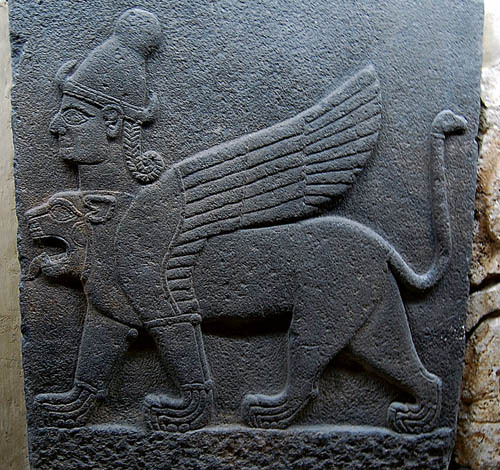 Note that the figure of a lion shows a human head and wings of a bird. This provides a good illustration for the apocalyptic imagery in Daniel, Ezekiel, Zechariah, and Revelation. Side view of Hittite Column Base from Sinjerli. Photo by Ferrell Jenkins. 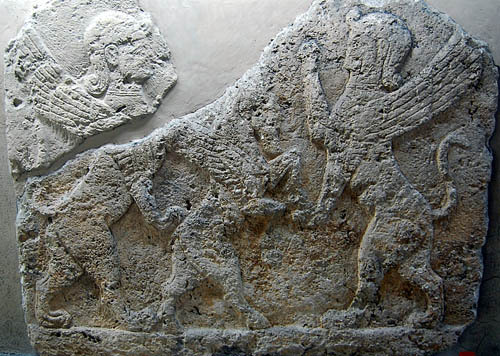 These are the Hittites with whom the ancient Israelites had dealings. Solomon imported horses and chariots from Egypt and Kue and exported them to the Hittites (1 Kings 10:29). See 2 Kings 7:6 for another reference to these people in the days of the prophet Elisha. All things considered, maybe it didn’t turn out so bad after all. 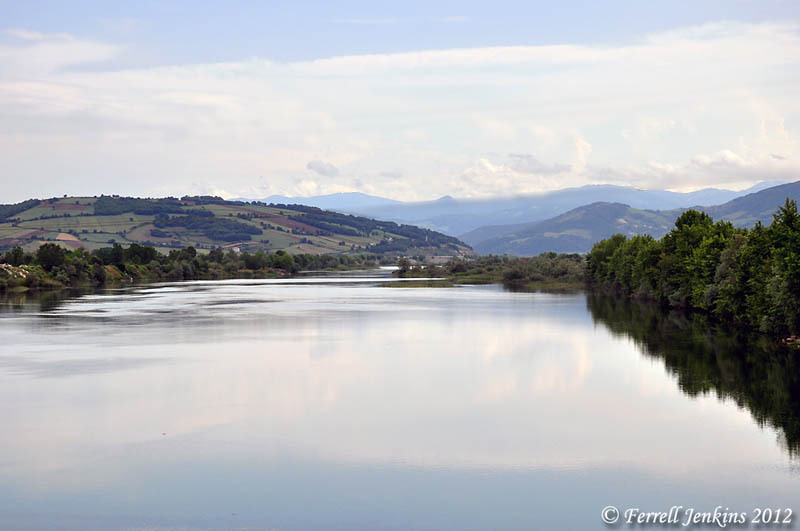 The Kizilirmak (Kizil Irmak) River was known as the Halys River in ancient times. The river flows past the Turkish town of Bafra into the Black Sea. Notice the Halys between Sinope and Amisos on the map below. It is about 35 to 40 miles west of Amisos. The river to the east of Amisos is the Iris. 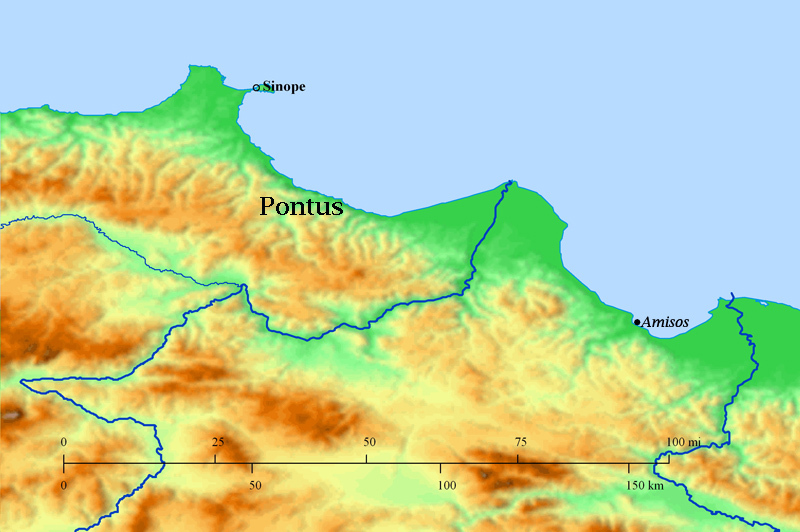 Map of Pontus showing Sinope and Amisos. 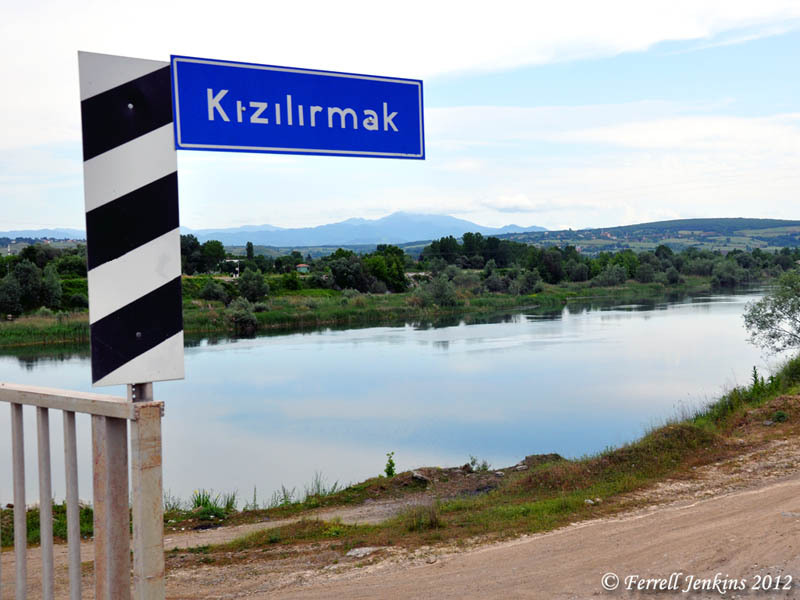 The Kizilirmak (Halys) River is located between the two towns, but closer to Amisos. Pfeiffer and Vos describe the importance of the Halys. The most important river of the peninsula [Asia Minor] is the Kizil Irmak (ancient Halys), 600 miles long, which originates in eastern Asia Minor and flows in a great bend to the southwest and finally into the Black Sea through what was Pontus. Unfortunately its gorge is often too narrow to permit it to be an important means of communication into the interior. (The Wycliffe Historical Geography of Bible Lands, 316). The photos below show the river flowing from the mountains on the south side of Pontus. These photos were made about 10 miles from the Black Sea, which is to the north. This is one of the widest areas of what was once the Roman province of Pontus. Kizilirmak (Halys) River flowing to the Black Sea. Photo by Ferrell Jenkins. The chief rivers besides the Halys were the Iris, Lycus, and Thermodon. The fertile land of their valleys and of the narrow coastal margin was separated from the interior by mountains, once heavily forested, which have always impeded communication with the plateau. Important products included fruit, corn, olives, and timber. (The International Standard Bible Encyclopedia, Revised (3:903). The ancient Hittite Empire comes to mind when I think of the Halys River, as Pfeiffer and Vos have pointed out. We say that the Hittites lived within the bend of the Halys River. A portion of Cappadocia (1 Peter 1:1) is also within that same bend. Seeing the Halys, which I had seen before near the Hittite capital, was a pleasant surprise. Scholarly book publisher Eisenbrauns announces the Eisenbrauns 2012 Mug. If you want to know what the Hittite proverb says, click on the link to Eisenbrauns. Just something on the lighter side for you to enjoy while I make my way across the Atlantic. We mentioned in earlier posts on apocalyptic literature that composite images were common among the Assyrians, Babylonians, and Persians. This was also true of the Hittites who lived in the upper Euphrates area. 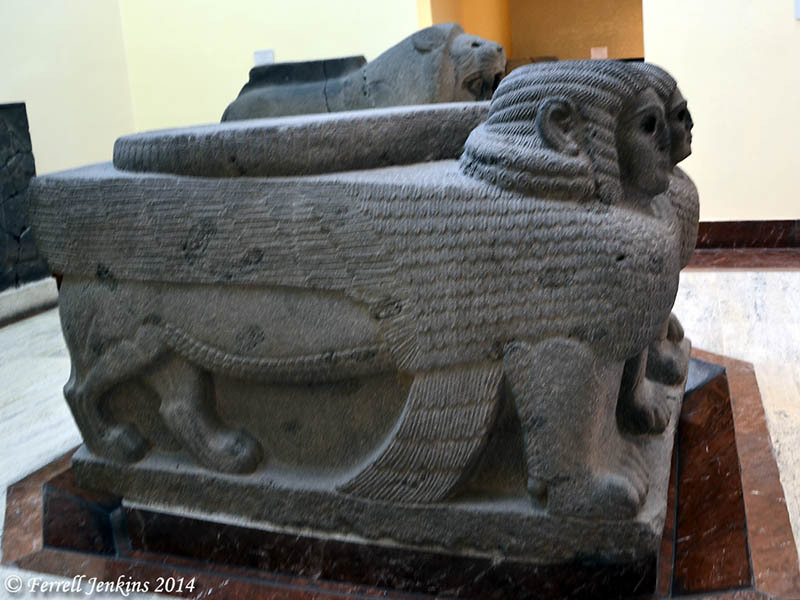 The Anatolian Civilization Museum at Ankara contains many of the reliefs from Carchemish on the Euphrates. 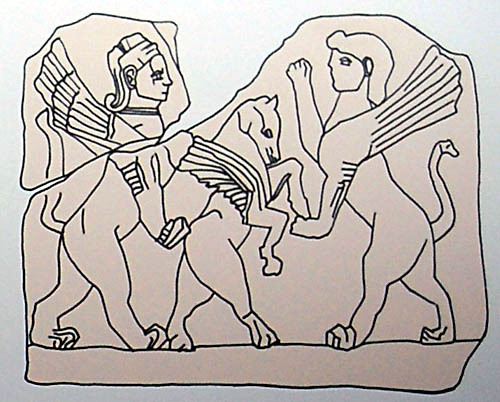 The one below shows two human-headed sphinx standing. There is also a winged horse standing between them. They appear to be dancing. Human-headed sphinx standing; winged horse standing. Photo by F. Jenkins. This drawing from the Museum may show the image more clearly. Notice the bird head on the tail of the sphinx on the right. Drawing of the human-headed sphinx and standing horse. This one is of special interest. It shows a lion with wings and a human head. The tail shows the head of a bird. There are four images in composite form. This basalt orthostat also comes from Carchemish. Judeans who were taken captive to Babylon traveled in this region on their way to their place on the Chebar (Kebar) River in southern Mesopotamia. We know that Nebuchadnezzar made his headquarters at Riblah in the land of Hamath. Because this region was part of the Fertile Crescent we can be sure that the Judeans traveled in the area on their long trip from Judea to Babylon. See 2 Kings 25:6-7. We are not saying that Ezekiel borrowed his composite creatures from the culture around him. We are saying that such was common and that it would not have been unusual or strange to Ezekiel or his hearers/readers. For the images in the book of Daniel we could show numerous composite creatures from Babylon.